(SEE AVAILABILITY ABOVE FOR ESTIMATED DELIVERY) - OrthoPro HyperEx Knee Brace - Left, Large, Mid - Thigh Circ: 20" - 27" - OrthoPro HyperEx Knee Brace - Effectively controls knee hyperextension & Genu Recurvatom. This brace combines comfort & stability in a hyperextension Swedish knee cage type brace. 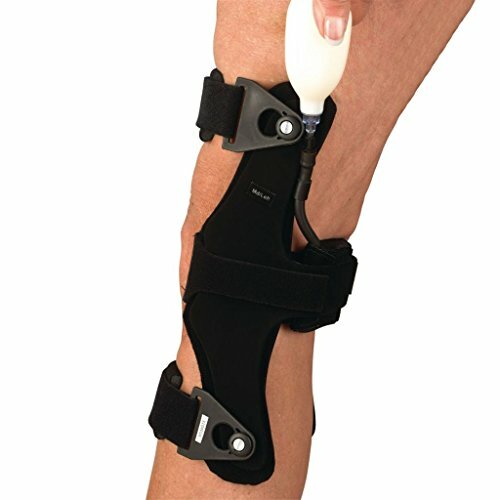 The unique addition of an air bladder with the hyperextension strap can reduce the force at the knee normally associated with other Recurvatum knee braces, significantly improving patient comfort. Low profile, light weight & easy to apply. Conforms to leg anatomy & provides superior comfort. Latex free. - Rolyan products are internationally licensed & manufactured for home & clinical use. Most of their products offer a lifetime warranty. The OrthoPro Hyper Ex Knee Brace effectively controls knee hyperextension and Genu Recurvatum.